23 by 21 by 21 1/4 in. 58.4 by 53.3 by 54 cm. 41 3/8 by 38 1/4 by 20 in. 105.1 by 97.2 by 50.8 cm. 20 1/2 by 23 3/4 by 25 3/4 in. 52.1 by 60.3 by 65.4 cm. 42 by 31 1/2 by 26 1/4 in. 106.7 by 80 by 66.7 cm. Mitchell-Innes & Nash is pleased to present Growth, a solo exhibition of new work by Sarah Braman at the gallery’s Madison Avenue location on the Upper East Side. This will be the artist’s third solo exhibition with the gallery and will feature a selection of newly developed aluminum sculptures alongside the wood and colored glass pieces for which she is known. Sarah Braman’s sculptures bring traditionally minimalist forms like the glass cube back to the realm of lived experience. Indeed, the artist’s engagement with formalist investigations in her work is always tied to the quotidian details of domestic life­. Braman has described the process of assembling the various elements in her sculptures as akin to the activities involved in arranging a home or tending to a garden. There is an inherent lyricism in the way she composes the works, not unlike words to a song or a table set for lunch. However, the artist’s use and recontextualization of these everyday items are not meant to form the timeless space of objecthood, a theater that expands the distance between the stage and its viewers. Rather, Braman’s works show that experience, both aesthetic and lived, exists in real time and at close range. The various components that make up her sculptures have histories that link the viewer to life- an encounter that is meant to be visceral as opposed to cerebral. 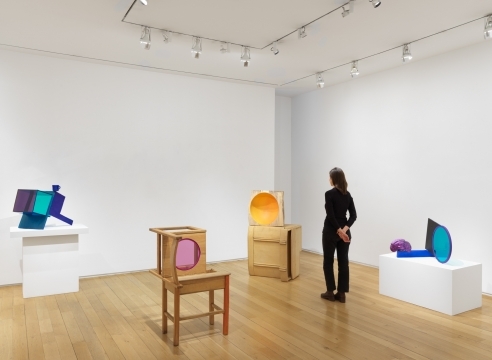 This exhibition is, in this way, an expansion of the artist’s 2016 show at the gallery wherein monumental sculptures provided intimate spaces that could be entered or otherwise interacted with. 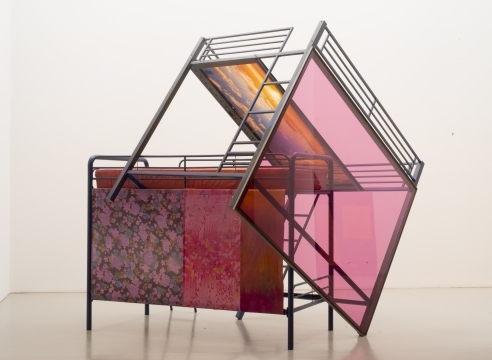 In Growth, Braman returns to a smaller scale with tabletop and floor sculptures while further developing the sense of refuge and discovery furnished by her larger works. The sculptor and painter Sarah Braman creates abstract artworks from Minimalist, no-frills materials like bits of furniture and plywood. She is perhaps best known for her sculptures that, like those of John Chamberlain, fuse scrapyard metal from cars; but she also spray paints many of her objects and sculptures, creating a Rothko-esque feeling of color-field painting upon her sculptural medium.